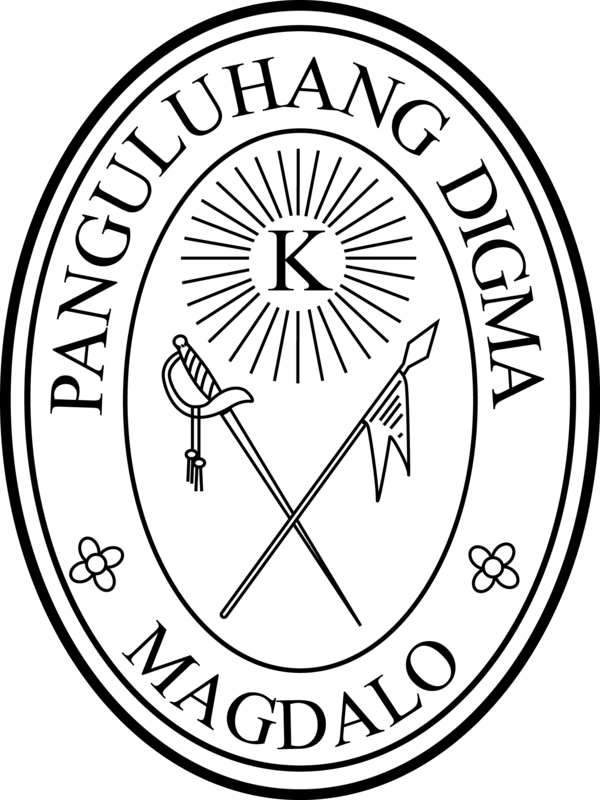 Seal of the Katipunan. The initials read as such: Kataastaasang Kagalanggalangang Katipunan Ng Mga Anak Ng Bayan. The First Republic traces its origins to the Revolution of 1896, which began under the leadership of the Katipunan, a secret society with a structure patterned after Freemasonry, and which aimed to attain independence for the Philippines. It was led by the President of the Supreme Council; the most well-known of whom was Andres Bonifacio. The Katipunan had members in Manila and other provinces in the Philippines. 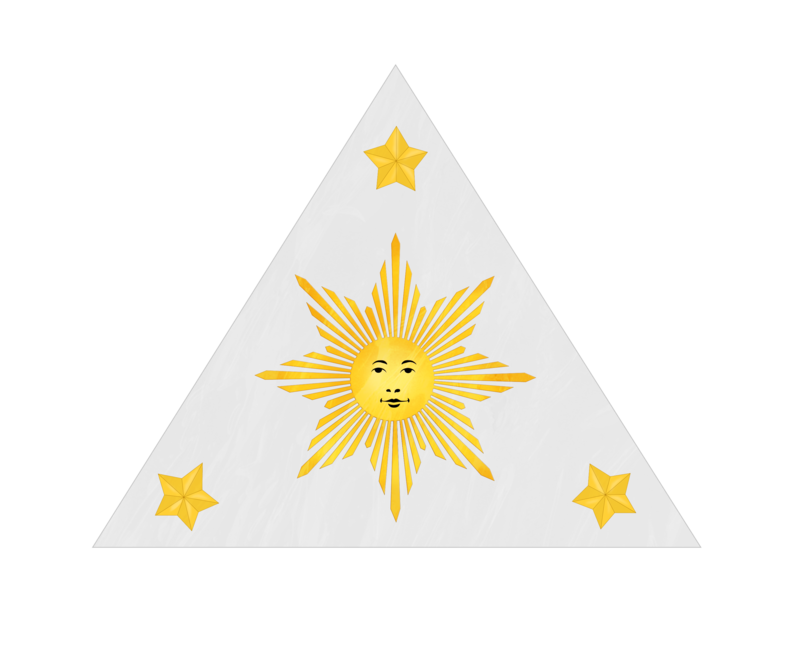 Due to political and other differences between the members from Manila and other provinces, divisions arose in the organization, prompting its leaders to call for a convention to try and reunify the society. 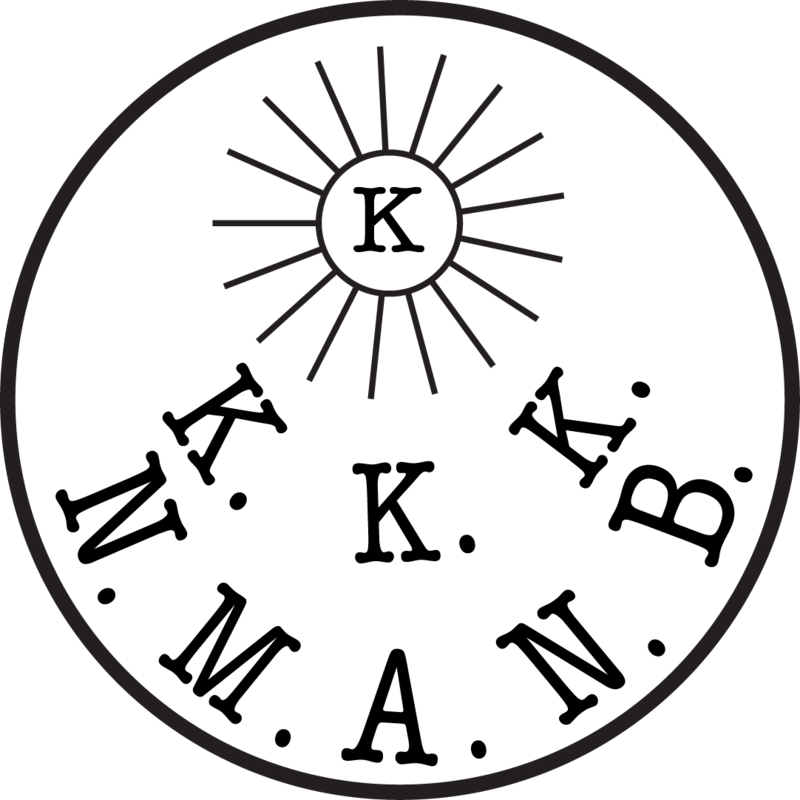 Seal of Aguinaldo’s Magdalo faction of the Katipunan. On March 22, 1897 the Tejeros Convention was held in order to reconcile the differences between the two factions of the Katipunan: the Magdalo, which viewed Emilio Aguinaldo y Famy as its leader, and the Magdiwang, which gravitated towards Andres Bonifacio. The outcome was a decision that the Katipunan should be dissolved and a revolutionary government established. Elections were held for its officers: Emilio Aguinaldo was elected President and Andres Bonifacio, the former leader of the Katipunan, was elected Director of the Interior. Initially, Bonifacio accepted his position, but was insulted when Daniel Tirona objected. Bonifacio declared the proceedings of the Tejeros Convention null and void and established a new government. This was seen as an act of treason by the others and Bonifacio was charged with refusing to recognize newly established Revolutionary Government. He was arrested and sentenced to death in Maragondon, Cavite. The Revolutionary government, led by Aguinaldo, continued the revolution against the Spaniards. At this point, the Spaniards were of the impression that the revolution was in decline and concentrated their efforts on pursuing Aguinaldo and his companions. By the latter part of 1897, Aguinaldo was forced by advancing Spanish forces to retreat to the mountains of Biak-na-Bato. 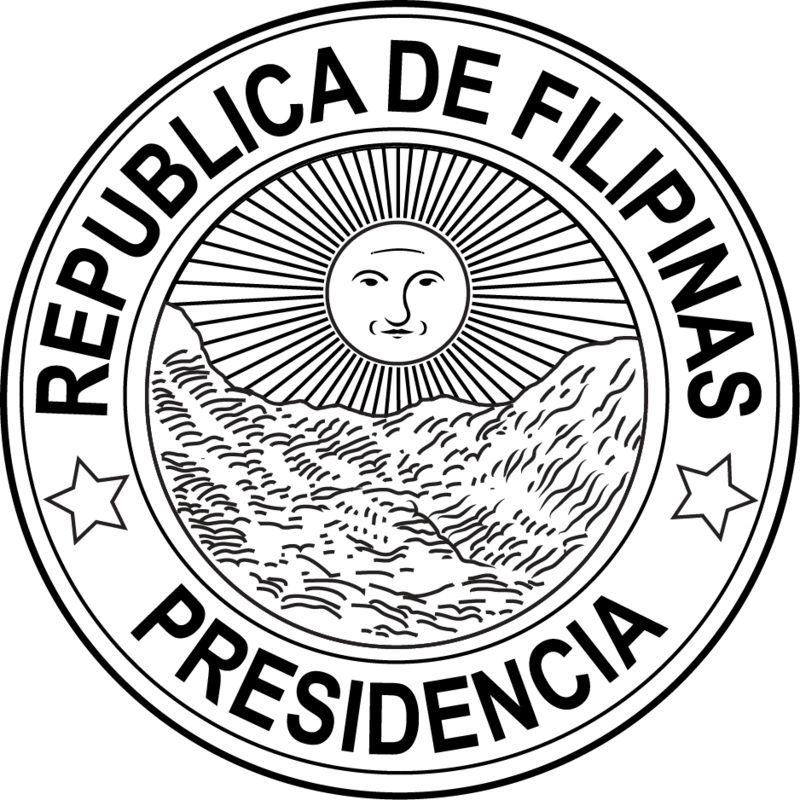 Seal of the Republic of Biak-na-Bato. On November 1, 1897, Aguinaldo, along with several revolutionaries, convened a citizen’s assembly in order to draft a provisional constitution for the Philippines, which has come to be known as the Constitution of Biak-na-Bato. The government established was to be headed by a Supreme Council composed of a President, Vice President, and four Secretaries empowered to govern. However, this plan never materialized because Aguinaldo entered into negotiations with the Spanish government. This resulted in an agreement under which Philippine Revolutionaries would go into exile in Hong Kong and surrender their arms in exchange for financial indemnities and pardons. The Pact of Biak-na-Bato, as it would later be called, was signed on December 15, 1897. Aguinaldo and the revolutionaries departed for Hong Kong on December 24, 1897. In Hong Kong, Aguinaldo and his companions established a Junta, which worked toward continuing the revolution and gaining freedom from the Spaniards. With the outbreak of the Spanish–American War, Aguinaldo, with members of the Hong Kong Junta, returned to the Philippines in the middle of 1898, to continue the revolution. On May 28, 1898, the Philippine Flag was unfurled for the first time at the battle of Alapan. Philippine Independence was formally proclaimed on June 12, 1898, when Aguinaldo waved the flag in Kawit, Cavite, and was declared dictator. There, the Philippine National Anthem was also played for the first time. Seal of the Dictatorial Government. Six days after the proclamation of independence, Aguinaldo issued a proclamation formalizing the creation of a dictatorial government responsible for assessing the needs of the country. The Dictatorial Government would last for only five days. Upon the advice of Apolinario Mabini, Aguinaldo issued a subsequent proclamation abolishing it and establishing a revolutionary government instead. Aguinaldo’s title was changed from Dictator to the President of the Revolutionary Government and Captain-General of its army. According to Mabini, this was done in order to prevent other provinces from viewing Aguinaldo’s dictatorial authority with suspicion. The proclamation also created a Revolutionary Congress to draft a constitution for the government. On August 1, 1898, the proclamation of independence was ratified by provincial delegates in order to legitimize the Revolutionary Government. 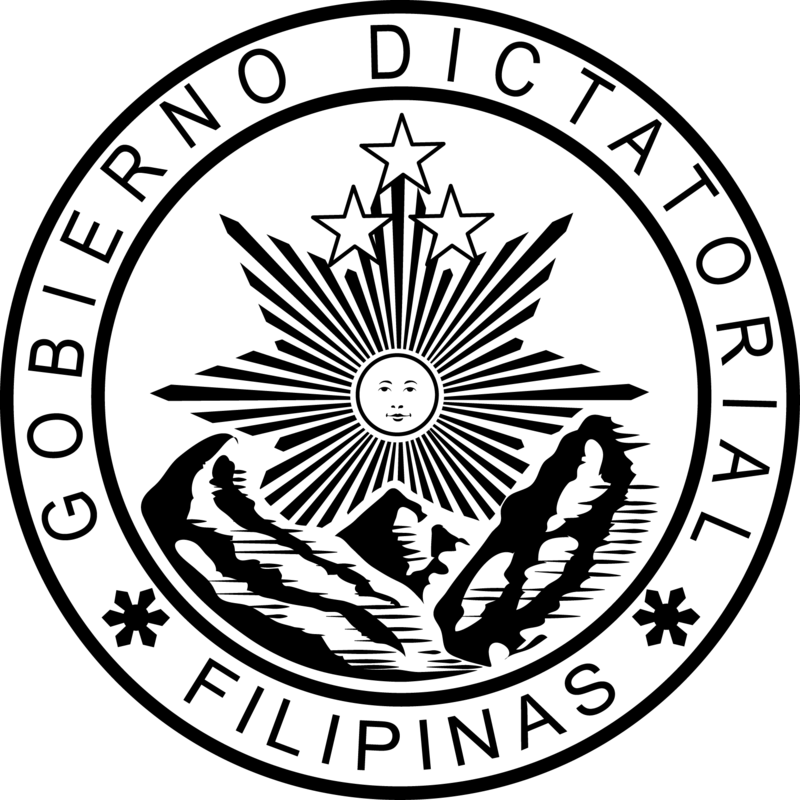 Seal of the Revolutionary Government. On September 15, 1898, the revolutionary Congress was convened in Malolos, Bulacan, tasked with drafting the constitution for the Philippines. The Congress was composed of both appointed and elected delegates representing all provinces of the Philippines. In the inaugural session of the Congress, Aguinaldo spoke and congratulated the delegates in his capacity as President of the Revolutionary Government. One of its first actions was to ratify the June 12, 1898 Proclamation of Independence yet again. The Malolos Congress approved the draft Constitution on November 29, 1898. It was returned by President Aguinaldo on December 1, 1898 for amendments, which were refused. President Aguinaldo finally approved the draft constitution on December 23, 1898. It was formally adopted by the Malolos Congress on January 20, 1899 and promulgated by President Emilio Aguinaldo on January 21, 1899. Seal of the First Republic. The constitution provided for three branches of government; an Executive, headed by the President and composed of department secretaries; a Legislature, headed by a Prime Minister and composed of delegates from provinces of the Philippines; and a Judiciary, headed by the President of the Supreme Court and its Justices. The Congress, as representatives of the different provinces of the Philippines, then elected Aguinaldo President of the Philippines. He was inaugurated on January 23, 1899 and on the same date the First Republic of the Philippines was formally established: with the full attributes of a state: three branches of government, a constitution, and territory under the authority of a government with an army.